On Community, Troy Barnes wore a Spider-Man shirt; in 2017, Donald Glover appeared as The Prowler in Spider-Man: Homecoming. On Community, Troy Barnes took part in a Star Wars spoof; in 2018, Donald Glover is Lando Calrissian in Solo: A Star Wars Story. All we're saying is, in 2019, Donald Glover better stay off any boats with LeVar Burton. Smooth and sophisticated, Captain Lando Calrissian stands ready to retire from the life of a smuggler and instead become a full-time gambler (or "sportsman," as he calls it), shuffling from card game to card game across the galaxy. Heh. "Shuffling." Cute. Solo's $114 million opening weekend was below expectations, to which most people would respond "I wish I had the luxury of considering earing $114 million in three days a disappointment," but the YouTube chuds who raged about The Last Jedi having too many female characters held it up as evidence that their calls for a general SW boycott were working. You know, because it couldn't have anything to do with the movie having to come in immediately after Infinity War and Deadpool 2 had already scraped up all the money or that no one was demanding a Teenage Han Solo movie in the first place. No, no, it was all the power of the "true" fans, saving the world from feminsim. Let us tip our trilbys and raise a Mountain Dew Code Red in their honor! The microwave dings. Our taquitos are ready. 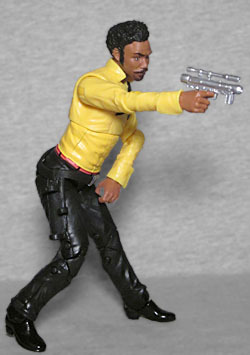 So Solo may have been unnecessary, but at least we get a Childish Gambino figure out of it. And considering the trouble Hasbro's had with some of the likenesses on this line, the toy does look a lot like the real man, from the set of his jaw to his Saw Gerrera haircut. Seriously, was that the style at the time? Universe only has two living black guys in it, and they both go to the same barber. At least this Lando has the right skintone - if last year's Episode V Lando hadn't been a yellowish-gray, you might have gotten to read a review of that by now. 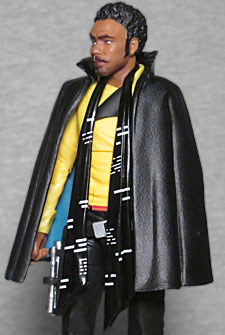 The original Lando was a product of the 1970s blaxploitation films, basically the same kind of pimp archetype as Sweetback or Superfly. Except in space. Yeah, he was cool and smooth like a bucket of Crisco, but he was also untrustworthy and duplicitous, even to his best friend. Even in a galaxy far, far away, where American ideas about race wouldn't even exist, the black guy is dangerous, shifty, and hyper-sexualized. Blaxploitation films used white America's racial anxieties to create their characters, George Lucas used those characters to create Lando, and Lando dresses the part. He is, as the bio stated, a gambler, and he apparently uses most of his winnings to buy fly clothes. 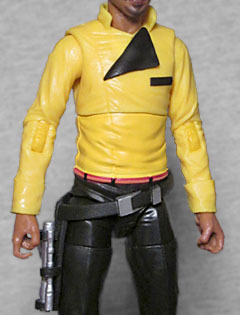 In a movie that's dominated by earthtones and muted colors, Lando is wearing a canary yellow shirt with a black lining. The scarf draped around his neck is black with thin white lines that call to mind the interiors of the Death Star, and he of course is wearing a cape: black, with a blue lining. So what, from a costume design standpoint, does this tell us about the character? Well, all the black on the exterior (the shoes, the pants, the cape covering everything) says he's trying to project a sinister air, that he's not a man to be *@^#$ed with, but the bright colors underneath are an enticement: they say "hey, get to know me, I'm not as sinister as I seem." But you've got to be careful, because as the folded-over flap of his shirt reveals, he does keep that darkness pretty close to his heart; it's always there, even when he seems to be lighter. Lando's articulation is the usual assortment we get with Black Series figures: swivel/hinge ankles, double-hinged knees, swivel thighs, balljointed hips, swivel/hinge wrists, swivel/hinge elbows, and a balljointed chest. The head is on a balljoint, like usual, but he doesn't have a hinge in the neck the way the other toys do; instead, there's a second balljoint at the base of the neck, where it joins the body. Why the change? Possibly so you can move the neck enough to get his scarf around it. What's honestly the most impressive, though, is that despite only having a single hinge in the elbows, the arms still bend as far as anatomically possible. How the heck!? 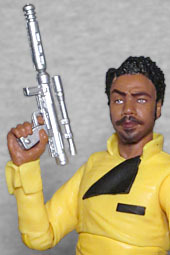 Beyond the scarf and the cape, Lando is accessorized with a two-piece pistol. It's silver and features a removable silencer(? ), and can be holstered on his hip when he's not holding it. You kind of have to wiggle it into or out of the holster (there are straps to fit around the barrel, the back end, and the sight), but it'll stay securely. Solo is not without its flaws - for one thing, every character is the same here as they were when we met them in the original trilogy, so they don't actually have any arcs to go through. Hell, the damn Millennium Falcon displays more character growth than Han or Lando do, and it's just a ship! They're just placeholders, repeating what we already know like one of those unauthorized fan-film continuations of Star Trek or something. And Donald Glover's Billy-Dee-Williams-as-Lando-Calrissian cosplay is good, but it still feels like somebody pretending to be Lando, not like Lando himself. The movie isn't bad, by any stretch of the imagination (matinee prices FTW! ), definitely good enough to make the figures desirable. Just, good luck finding anybody other than The Young Indiana Jones Chronicles.